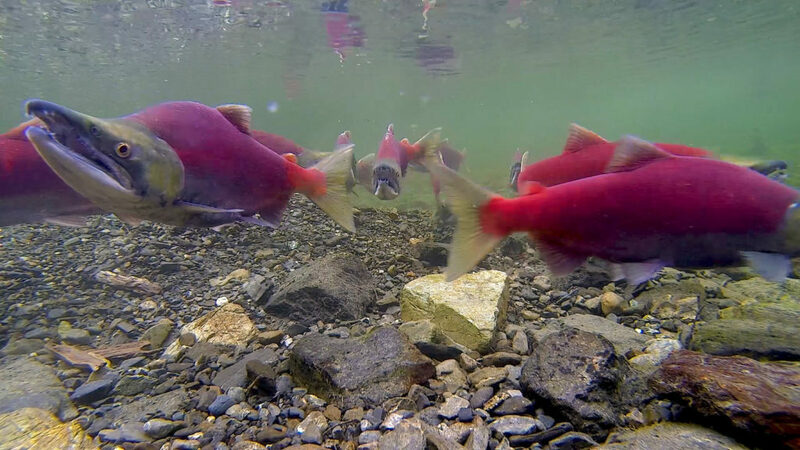 The first salmon runs (sockeye and chinook salmon) of the Copper River begin in early to mid-May. The commercial fishery on those fish is an ocean/estuarine gillnet fishery focused near the barrier bars at the base of the Copper River delta. Fisheries opportunities in the Copper River district are actively managed, with one or two fishing openings per week of variable length (usually 12 to 48 hours). 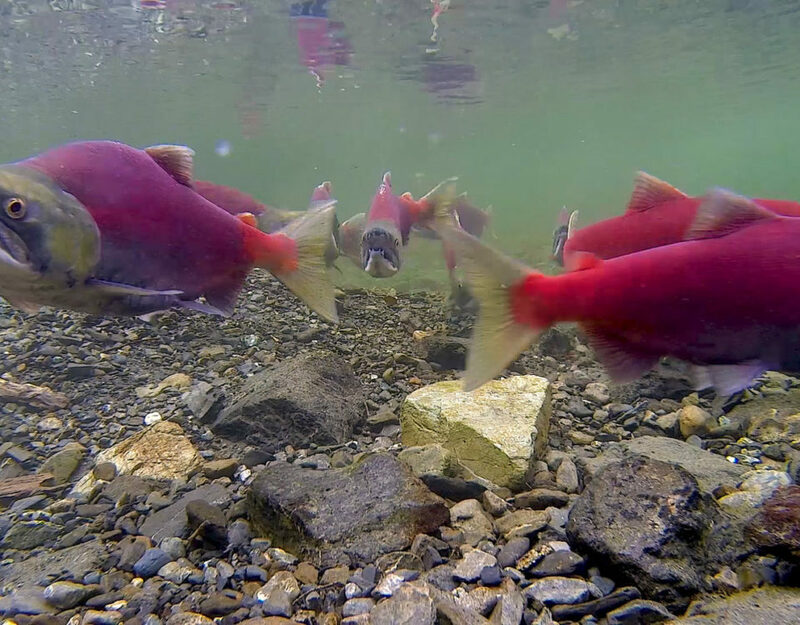 The decision to open the fishery depends in part on escapement estimates made at an acoustic weir operated by the Alaska Department of Fish and Game (ADF&G) at Miles Lake at the former terminus (mile 49) of the Copper River Highway (figure 1). ADF&G operates imaging sonars on both banks, and fish are counted by eye by technicians as they pass, which results in very good estimates of escapement. 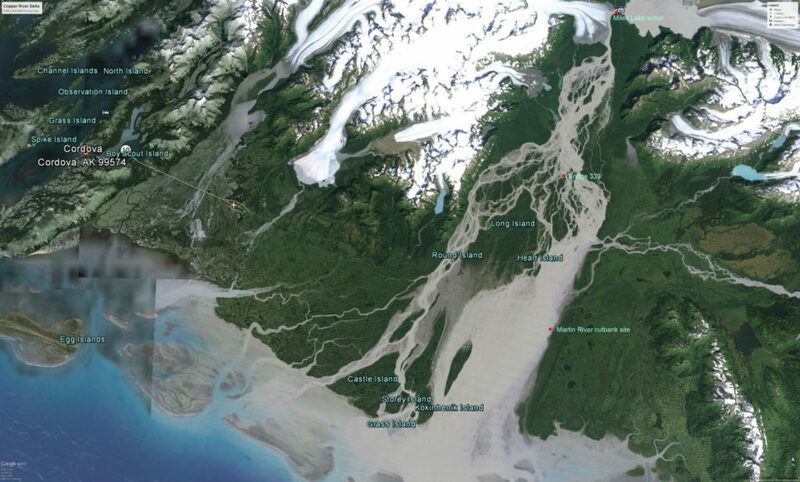 The ADF&G Miles Lake sonar site is located at the first point above the Copper River delta where the river is confined to a single channel, and is approximately 35 miles from the nearest ocean entry point to the Copper River Delta at Kokenhenik Bar. Direct measurement of the swimming velocity of up-migrating salmon has not been done in the Copper River, but estimates from matching up abundance peaks between the fishery, a site at Flag Point (~15 miles from the ocean) and the Miles Lake site suggest that it takes at least 3 to 5 days for salmon to transit through the delta (Degan et al., 2005). The lag between the time when the fish enter the river (and are no longer available to the fishery) and when they pass the counters at Miles Lake greatly complicates timely management of effort by the fishery, and can lead to escapements in excess of expectations. The Copper River fishery is the first major salmon fishery in Alaska to go to market each spring, and commands a price premium. Copper River salmon travel several hundred miles to their spawning grounds and are prized for their high fat content. Several years of concerted marketing efforts by the Copper River / Prince William Sound Marketing Association (CRPWSMA, a fishery-supported Regional Fisheries Development Association) has successfully positioned Copper River salmon as a premium brand, and the fishery generates a large amount of revenue with a relatively small number of fish. Because prices generally start high and decline quickly as more and more fish come to market, the timing and availability of fisheries opportunities in the early part of the season directly impacts the amount of revenue generated by the fishery, which directly impacts the local economy. 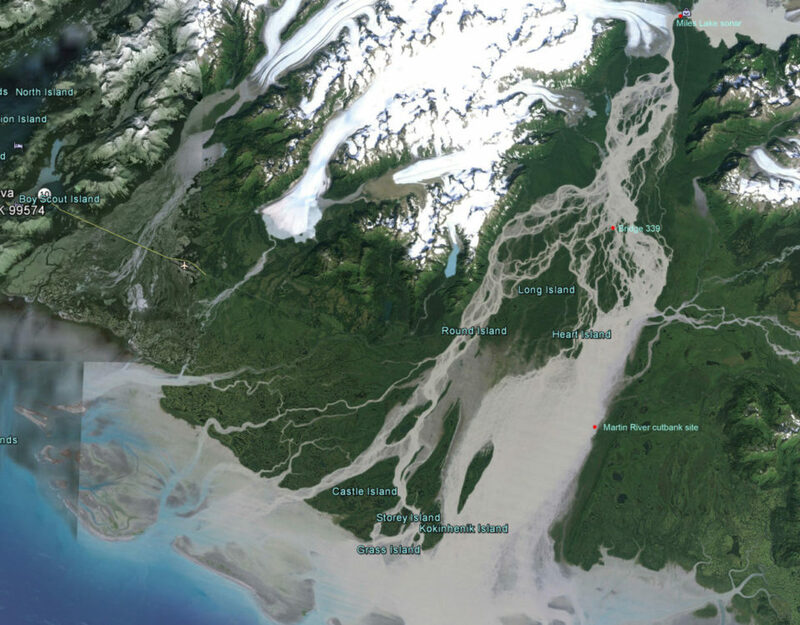 A pilot study done by the Prince William Sound Science Center in 2015 for the CRPWSMA indicated that a channel in the lower delta near the Clear Martin River, about 10 river miles from the river mouth was the lowest possible point in the Copper River delta where fish might be counted with acoustic methods. Three different sonar systems were tested, and directly compared to the ADF&G sonar at Miles Lake. In 2016 and 2017, again with support from the CRPWSMA, PWSSC operationally deployed imaging sonars at the lower delta site for the early portion of the Copper River salmon run (May – early June). The sonars are only deployed for the early part of the run because as river stage height increases into June, a number of auxiliary channels come on line and give up-migrating salmon many other options. In 2017, two sonars (Tritech Gemini 720is sonars) were purchased for use by this project. The sonars are deployed on adjustable frames on both sides of the river, and aimed to ensonify salmon as they swim past. Recording is done automatically for a portion of every hour, and videos are produced from the echograms and posted online in near real-time. Counts of fish passage are also posted online several times per day.